About Roxanne Barkofsky, in her own words, "My fibre works are primarily constructions from fabric and threads in which are integrated non-textile elements to enhance the composition. 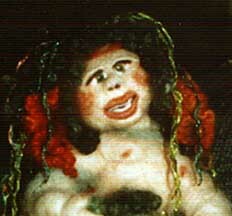 Each of the fibre works uses a number of techniques to accomplish a desired effect. Each has a central theme around which the work is created. 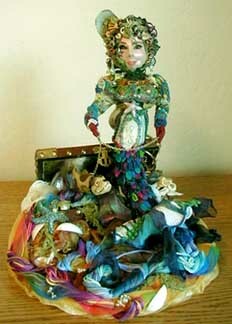 About the Salt Siren, Victor-Ena, in Roxy's own words: VICTOR-ENA, an ART NOUVEAU Folklorique Doll, has learned to be frugal, as well as inventive, having lived in the briny deep blue sea for so long. It is there that she learned valuable lessons in recycling. 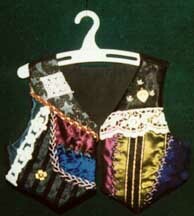 When the Titanic went down she made fast "strokes" for it and is ever so pleased with her steamer trunk treasures, which have provided her with a corset and bustle, as well as a bodacious bodice with a high collar fashioned from the finest lace. In her vintage finery, Victor-Ena is a model of elegance as she takes her DOGFISH, Cap-White for his daily "swalk." Cap-White loves to be scratched behind his fins by his Sea-Siren mistress, especially since she had plastic surgery to change her fins to claws ... much more practical, says the lady. 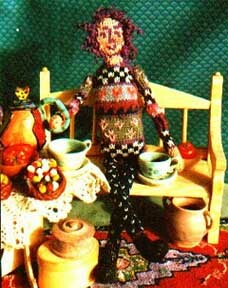 Victor-Ena's true treasures, however, are the skeins of CARON threads, affixed to the base and treasure chest, which enticingly await a stitcher's further fancy. Our Maid le Mer's hair is formed from WATERCOLOURS, soaked in a stiffening solution and wrapped around pencils and skewers, then put in place when dry. 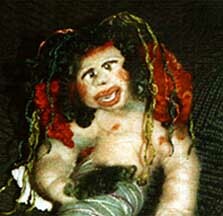 Beneath her coil of curls is a matt of knotless netting worked in IMPRESSIONS. Partially "shredded" RACHEL Double Dipped serves as seaweed. Our beauty maneuvers the ocean's depths just "swimmingly" as her lower body, completely covered in woven picots to resemble scales, undulates seductively in the waves. 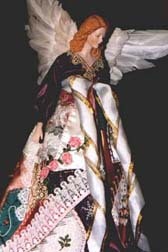 She credits this last fashion statement to CARON'S SNOW, RACHEL Double Dipped, and WATERCOLOURS, worked in a variety of fantastic colors. Victor-Ena is named in honor of my two friends, Vickie Tobin and Ena Flynn, and the fetching mussel in her hair was placed there in honor of Rita Vainius, whose home is named Mussel Shoals. 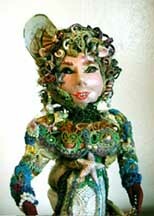 I enjoyed creating her because she represents what I consider an ultimate and intimate artistic experience. 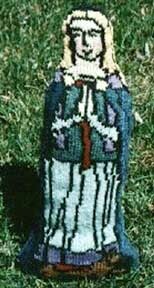 Gail Horton, a trained artist, turned from painting to rug hooking in the early '80's. A strong influence in nurturing Gail's talents was Hulda Dimon, her grandmother, who taught her how to crochet and embroider. An innately thrifty farm wife, Hulda saved fabric scraps to fashion into woven rugs, quilt tops and hooked rugs. Gail embraced this practice and to this day, never discards any item of apparel without considering the possibilities of giving it a new life in one of her rugs. Gail's rugs are, she states, "paintings executed in textiles." Through the medium of burlap and wool, her tell the story of the rich maritime life on the far eastern end of Long Island, NY. The most common motifs appearing in her work are mermaids, fish, ships and sailors, which whimsically capture the lure of the sea and provide a sense of place. Though Gail changed her artistic medium from oil and gouache to textiles, her rugs embody her uniquely painterly approach --something that sets her work apart from that of traditional rug hookers. Naturally curious and inventive, Gail is forever experimenting with different yarns, fabrics and techniques, as well as delving into other handcrafts. 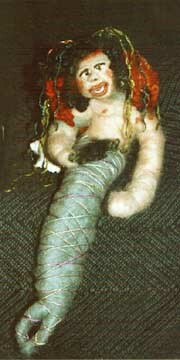 Her soft-sculpture mermaid doll, christened La Sirena, evolved from a recent dry felting class. 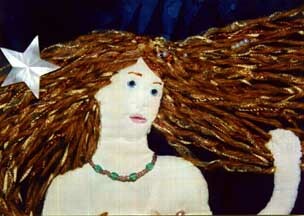 After the felting was completed, Gail further embellished her sea siren's tail with Watercolours and then used Rachel and Rachelette threads to simulate seaweed tangled with her matted hair. 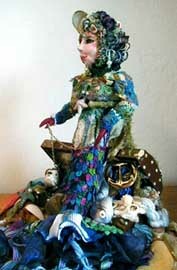 Gail's works form part of many private collections. She exhibits at museums and galleries: the Hallockville Farm Museum on Long Island and the South Street Seaport Museum in NYC. 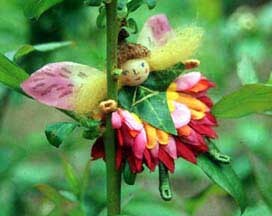 She was a featured artist in Crafts of America and has contributed articles to Rug Hooking Magazine. She also teaches rug hooking and gives demonstrations and gallery talks about her work. 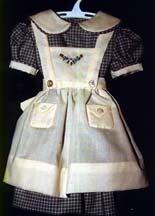 For information about Betty Pillsbury and a Class to create a Silken Roses Collar, designed by Betty to embellish a doll's dress, see this month's Online Class. 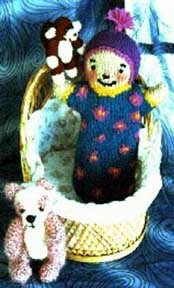 The lovely lanky Lily is a fun excursion into simple Fairisle knitting. directions for knitting her teddy bear and monkey, too. 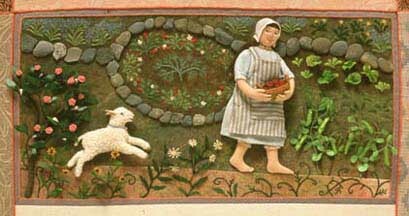 This elegant Medieval Lady and her faithful little dog will grace any room. 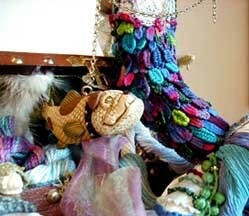 For a Special Designer Profile on Noreen Crone-Findlay, see the Designer Spotlight in Part I of our Doll Themed Site. 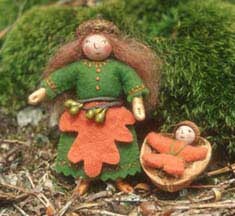 For an Online Class using Punch Needle Embroidery to create a Celtic Angel Pin or Pocket Dolls designed by Noreen, see this month's Bonus Designer Online Class.